"On October 6, in the year 1536, a pitiful figure was led from a dungeon in Vilvorde Castle near Brussels, Belgium. For nearly a year and a half, the man had suffered isolation in a dark, damp cell. Now outside the castle wall, the prisoner was fastened to a post. He had time to utter aloud his final prayer, 'Lord! open the king of England’s eyes,' and then he was strangled." My interest was piqued. 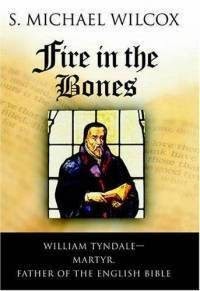 The man he was speaking of was William Tyndale, and much of the information he went on to share was compiled from the biography, Fire in the Bones by S. Michael Wilcox. That evening, I put it on my to-read list, and the good thing about Goodreads is that it doesn't let you forget about the books you put on there . . . even if it takes four years for you to pick them up. At the beginning of this year, I decided that I really wanted to make an effort to read this book, so I made one of my goals, "read a biography." As far as biographies go, this one is on the short side (only 235 pages), so I figured it would be a relatively easy goal to check off.
. . . And then, after almost an entire year and multiple renewals, I finally finished it. It turned out to be slower going than I originally thought, but I'll talk about that in a minute. First, let me tell you a little about William Tyndale. He lived during the 16th century, and while you might not recognize his name, you almost certainly would recognize some of his words, including some that are especially appropriate at this time of year: "For unto you is born this day in the city of David a Saviour, which is Christ the Lord." In 1520, the Bible was confined almost entirely to Latin, which made it purposely inaccessible to the common people. A few incomplete translations had been rendered, but Tyndale decided to take on the entire New Testament with the goal that "If God spare my life, ere many years I will cause a boy that driveth the plough shall know more of the scripture than thou [the pope and clergy] dost." With the help of several brave friends, Tyndale translated the New Testament and large portions of the Old Testament, published his translations, and got them into the hands of men and women who were starving for the word of God. He lived in exile and eventually was found and executed. Before reading this book, I didn't give much thought to the differences in various translations of the scriptures. Of course I knew there were differences, and I know many people who compare various translations to gain added insight into the scriptures, but since we mainly use the King James translation of the Bible, I didn't think much about where some of the phrases we know and love, such as "still small voice," "I stand at the door and knock," and "let there be light," came from. All three of the above quotes happened to be translated as such by Tyndale, and I really thought it was fascinating to learn about how his translations influenced the English language in general, as well as the language of the scriptures. I was especially interested to learn about the word "atonement." Although Tyndale didn't create the word, he was the first person to use it in reference to "Christ's redeeming act." It happens to be one of the words most loved in my faith because it attempts to encompass all that Christ did for us when He took our sins upon Himself. And while it's rather audacious to assume that a single word could convey the magnitude of such an event, the word "atonement" tries to do just that, and I'm so grateful we have it. But then there were parts of the book that whipped right along. For example, when I was reading about Tyndale's betrayal by Henry Phillips (a man straight out of a Dickens' novel if ever there was one), I didn't have to make myself read it at all. I wanted to find out what was going to happen next (even though I was already aware of Tyndale's fate). This particular biography of William Tyndale is probably different from most of the other ones out there (not having read any others, I'm taking a wild guess here) because it's written by an LDS author. So S. Michael Wilcox makes a lot of connections between the Bible and the Book of Mormon and also makes the logical point that without William Tyndale, the boy Joseph Smith would not have been sitting in his living room reading the Bible. He would not have read the verse in James that reads: "If any of you lack wisdom, let him ask of God," which prompted him to go to a secluded grove of trees. He would not have had a vision that changed the course of his life and led to the restoration of the Gospel. While I really liked the added insight this perspective gave to my own beliefs (the chapter that talked about Nephi's vision where he saw the early colonists traveling across the ocean with a book that was "of great worth" to them was especially poignant for me), it might not be for everyone. But then again, it might. If you are not Mormon and end up reading it, I would love to hear your thoughts on it. As I read about Tyndale's struggles and many sacrifices, I couldn't help but think about what his reaction would be if he knew about the easy access most individuals now have to a Bible. There's a copy of it in the nightstand of every hotel room. You can buy it for 50 cents at the local Goodwill. You can read it for free on the internet. Tyndale said: "I would wish even all women to read the gospel and the epistles of St. Paul . . . I wish that the husbandman may sing parts of them at his plow, that the weaver may warble them at his shuttle, that the traveller may with their narratives beguile the weariness of the way." It seems his wish has been fulfilled, but there's a part of me that wonders if having it at our fingertips has devalued it. Has the pendulum swung to the opposite side? When no one could read it, everyone wanted to. Now everyone can, but no one wants to. Reading about Tyndale's death and the deaths of so many others (seriously, the authorities did not bat an eye about executing anyone, guilty or not) to put this book into the hands of common people deepened my appreciation of it so much. I can't even tell you. I am so grateful that I can hold it in my hands and read it each afternoon or evening. There have been times in my life when I didn't give it the value it deserved, but I hope I never treat it so lightly again. Wow, this comment made my day! I'm so glad you were able to use part of this in your lesson. William Tyndale was an amazing man, and learning about his sacrifices really made me appreciate the Bible so much more. Thank you again for taking the time to tell me about your experience!